Planets Forming Around a Sun-like Star? By Keith Cowing on December 6, 2004 9:22 PM. "We present resolved scattered-light images of the debris disk around HD 107146, a G2 star 28.5 pc from the Sun. 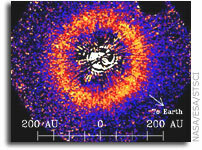 This is the first debris disk to be resolved in scattered light around a solar-type star. We observed it with the HST/ACS coronagraph." "Astronomers will present new findings from NASA's Hubble Space Telescope and Spitzer Space Telescope at a listen-and- logon news briefing, Thursday at 1 p.m. EST." This page is an archive of entries in the Astronomy category from December 2004. Astronomy: September 2004 is the previous archive. Astronomy: February 2005 is the next archive.